Did I say those words out loud when I saw Marcel Eisele’s images for the first time? No. But it almost happened. That’s got to count for something. What I find so amazing about Eisele’s work is that he’s able to do so much with so little. Or at least what seems like so little. 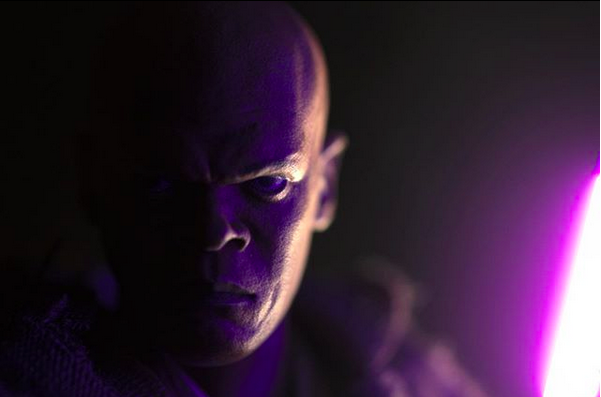 Take this shot of Mace Windu. It’s really just a tight shot with a lighting effect. But given the face sculpt, and Eisele using just the right amount of lighting to keep half the figure’s face in the shadow, the end result has so much gravity. Imagine walking into this guy on the dark end of the street. Yeesh. A little bit of pee just came out. In a write-up done by BanthaSkull.com about a year ago, Eisele mentions taking a lot of shots in his backyard. I can only assume that’s where this was taken. It’s tough to go wrong with a silhouette. Don’t discount the timing element here. It feels like sunsets go by really fast when you’re trying to beat the clock. Again, seemingly very simple. 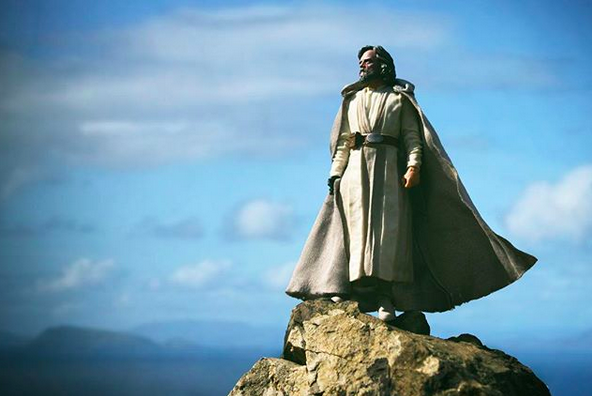 What we have here is basically a superhero shot of Luke on Ahch-To. You get the right angle, and the cape and the background do most of the work. But what is the right angle? How far back go you go? How much of the terrain do you show? How do you nail the figure’s positioning? Somehow, Eisele answered all these questions correctly. Because what he gave us here is damn near iconic. Here’s one that hits you right in the damn feels. We never did get to see Luke and Han on screen together one last time. It might have a Grumpy Old Men vibe to it. But who cares? It’s Luke and Han. Eisele also does some customization, as is the case with these next two shots. I appreciate this one because it sneaks up on you. 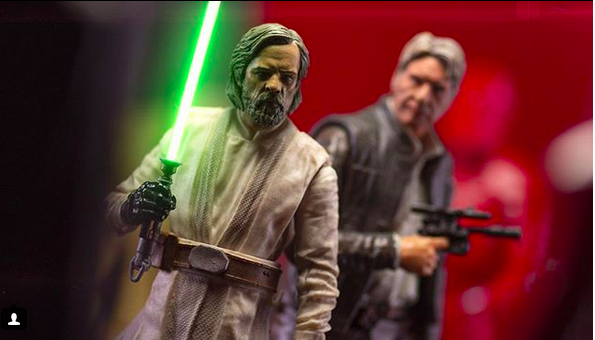 When you’re scrolling by, it’s easy to assume that’s Luke behind Rey. But when you actually look at it, you’re surprised to see it’s an alt-universe Han Solo. Rocking the Jedi Master beard, no less. Then there’s this last one, which I absolutely love the imagination behind. 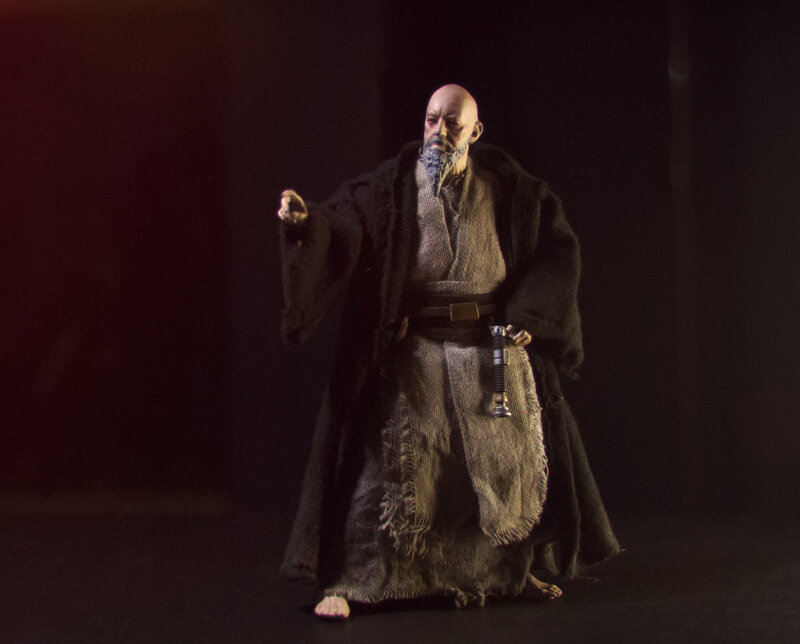 A custom-made “Dark Side Obi-Wan Kenobi.” There’s also a shot of this figure with a red lightsaber, thus unofficially classifying him as an evil Sith. But I like this image better, as I’m not in love with the idea of an evil Obi-Wan. By not drawing focus with the lightsaber, this pic allows us to take in all the differences between this character and the one we knew from A New Hope. The bald head, the longer beard, the bare feet, the tattered and dirty robes. I like to imagine this figure as Obi-Wan from a darker timeline, as opposed to being on the dark side himself. Perhaps not Old Ben Kenobi, but Older Ben Kenobi. This entry was posted in Toy Chest Theater and tagged 3lesie, action figure photography, action figures, Ahch-To, Alec Guinness, BB-8, Ben Kenobi, Daisy Ridley, Han Solo, Harrison Ford, lightsaber, Luke Skywalker, Mace Windu, Marcel Eisele, Mark Hamill, Obi-Wan Kenobi, Old Ben Kenobi, Rey (Star Wars), Rob Siebert, Samuel L. Jackson, Star Wars, Star Wars movies, Star Wars toys, Star Wars: Episode IV - A New Hope, Star Wars: Episode VII, Star Wars: Episode VII - The Force Awakens, Star Wars: Episode VIII - The Last Jedi, Star Wars: The Force Awakens, Star Wars: The Force Awakens toys, Star Wars: The Last Jedi, Stormtroopers (Star Wars), Tatooine, The Last Jedi, Toy Chest Theater, toy photography, toys on 12/13/2018 by primaryignition. More socks this week. I’ve got a lot of socks, folks. You’re going to see a lot of them. My sister-in-law got me a Loot Wear subscription this past Christmas. So I’ve been getting two pairs of geeky character socks in the mail once a month. Most of them are pretty cool one way or the other. But this photo is from the month they really landed in my wheelhouse. On the left you have the Hoverboard design from Back to the Future Part II. And of course, on the right you have BB-8 of Star Wars fame. It’s one thing to hear an extremely obvious, low-hanging fruit of a joke. It’s another thing entirely to be bombarded with it over and over. If you want me to hate something, shove it down my throat over and over. Call it the John Cena/Roman Reigns effect. Mrs. Primary Ignition bought me The Last Jedi on DVD a couple of weeks ago, and a few days ago we finally watched it together. While the movie has a fair share of problems (in case you hadn’t heard the legions who complained about it), a second viewing left me feeling a little warmer toward it. In contrast, my view of Rogue One hasn’t shifted at all. It remains the only Star Wars movie I knew I disliked as I was leaving the theater. I’m cautiously optimistic about Solo: A Star Wars Story. Unlike Rogue One, at least I know that movie actually has characters in it. Characters I care about. 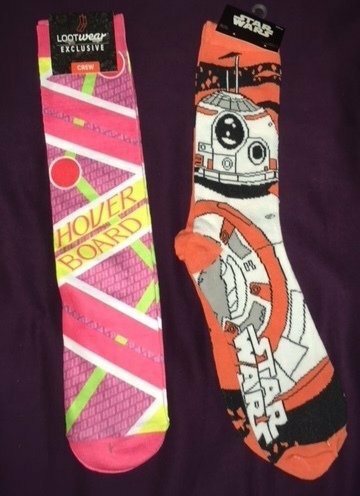 This entry was posted in The Fanboy's Closet and tagged Back to the Future, Back to the Future Part II, BB-8, character socks, Hoverboard, John Cena, Loot Crate, Loot Wear, Mrs. Primary Ignition, Rob Siebert, Rogue One: A Star Wars Story, Roman Reigns, socks, Solo: A Star Wars Story, Star Wars, Star Wars: Episode VIII - The Last Jedi, Star Wars: The Last Jedi, The Fanboy's Closet, The Last Jedi on 04/23/2018 by primaryignition. Mrs. Primary Ignition and I are going to see The Last Jedi tonight. So naturally, last night we sat down to watch The Force Awakens. It was her idea, actually. Ladies, if you’re husband is a geek, ask him if he’s up for sitting down with some chili and a Star Wars movie. See what happens. Obviously I’ve seen it a number of times already. In addition to officially reviewing it two years ago, I’ve discussed numerous elements here and there. The Force Awakens rightfully got a lot of flack for mimicking the original film. But I still love it. I can’t help it. 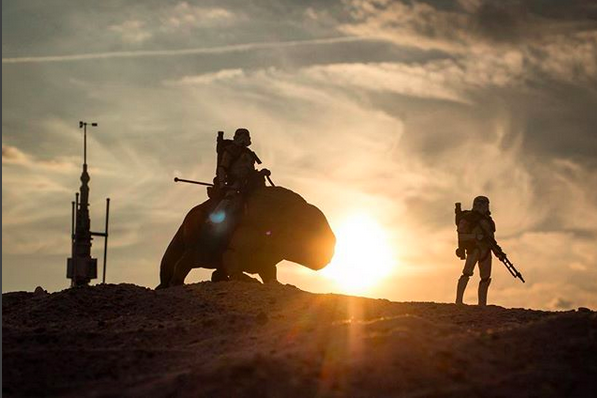 There’s just something about Star Wars that brings out the inner child in so many of us. The Force Awakens did that in a way the prequels didn’t. Moreso, The Force Awakens was a hell of an accomplishment. It breathed so much new life into the franchise, by introducing new faces and telling new stories. It restored some of the magic of the original trilogy by incorporating more practical effects, and not leaning so heavily on CGI. We had yet another epic score from the incomparable John Williams. In the end, it set the bar pretty damn high for Disney’s foray into the Star Wars universe. Mere minutes into the movie, Mrs. Primary Ignition asks: “Who built BB-8?” A fair question, I suppose. It’s sometimes tough to wrap your head around the idea that these robots, who play such pivotal roles in these movies, were mass produced in a factory somewhere. Unless you’re C-3PO, of course. What The Force Awakens suffers from more than anything is a lack of exposition. When we were last in this universe, the Empire was being dealt a fatal blow. The implication was that they were gone for good. Then in the opening title crawl we’re told the First Order has “risen from the ashes of the Empire.” So where did they come from, and when? How did they acquire all their resources? Has there been relative peace in the three decades since Return of the Jedi? I understand certain things had to be kept a mystery. But little tidbits here and there to fill in the gaps would have been helpful. Captain Phasma has a great look. Her armor is a nice extension of the stormtrooper get-up, and works as a symbol of the unwavering strength of the First Order. It’s also perfect to base toys off of. That always helps. On a similar note, I’ve never liked the blasters the First Order troopers use. The mix of white and black makes them look like toy guns. You can pinpoint the moment the audience is supposed to understand Rey is a good guy. When she’s sitting there cleaning off the parts she found in the old Star Destroyer, she looks at a frail old lady across from her doing some cleaning of her own. We see sympathy and compassion on her face. Thus, we make a positive connection with her. Remember, t this point in the film Rey hasn’t spoken yet. So it’s a nice subtle move. 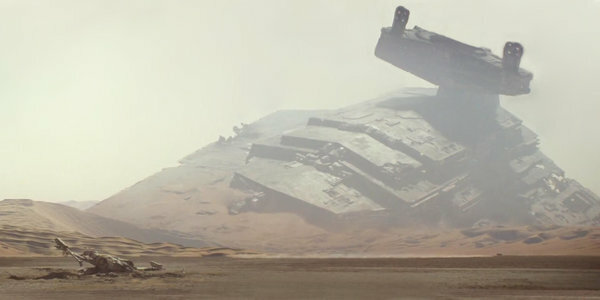 The Empire’s last stand took place on Jakku. That’s why we see the crashed Star Destroyer, the downed AT-AT that Rey lives in, etc. But no one else us this. Again, lack of exposition. It doesn’t make or break the film either way, but it would have helped. There are a lot of little details that are meant to make your brain associate The Force Awakens with the original trilogy. The noise the mouse droids make. The placement of the gas masks on the Millennium Falcon. The belch noise from the rathtar monster. That’s to say nothing of the more overt stuff, like the chess board and remote on the Falcon. The Mos Eisley Cantina has to be one of the most imitated settings in cinematic history. Even within in the Star Wars universe, creators can’t help but put their spin on the idea. We obviously get that here with Maz Kanata’s cantina. It was fine. But it was pretty obvious what they were doing. Should Kylo Ren/Ben Solo have had a pale, worn face that hadn’t seen light in awhile? When he takes his helmet off, he just looks like a normal guy. But I picture him never wanting to be seen without it, much like Darth Vader. There’s a great little moment with Leia that was cut from the movie. Now that Carrie Fisher is gone, I really wish they’d kept it in. Leia is talking to someone about contacting the Senate and insisting action be taking against the First Order. That line, and the way she delivers it, are so great. Considering how open Carrie Fisher was about her own mental illness, I bet she loved that line. I don’t think the line between Carrie and Leia was ever thinner than during those three sentences. My favorite exchange in the movie happens between Han and Finn while they’re trying to infiltrate the Starkiller Base. Han’s death scene is still hard to watch. Even when you know it’s coming, it doesn’t help. That horrified roar from Chewie might be the worst part of it all. There’s a fan theory that Han actually pointed the lightsaber at himself, allowing Ben to turn it on and kill him. The idea being that he knew Snoke would kill Ben if he failed to carry out the deed. It doesn’t make the most sense. But stranger things have happened. I love the fight between Kylo Ren and Rey. There’s very little fancy fight choreography, and neither look like extremely polished fighters. They’re just wailing on each other. It’s also a different environment than we’ve ever seen a lightsaber fight, which is accentuated when Rey uses the snow to extinguish Ren’s weapon. The music callback from A New Hope when Rey catches the lightsaber is a touching moment. 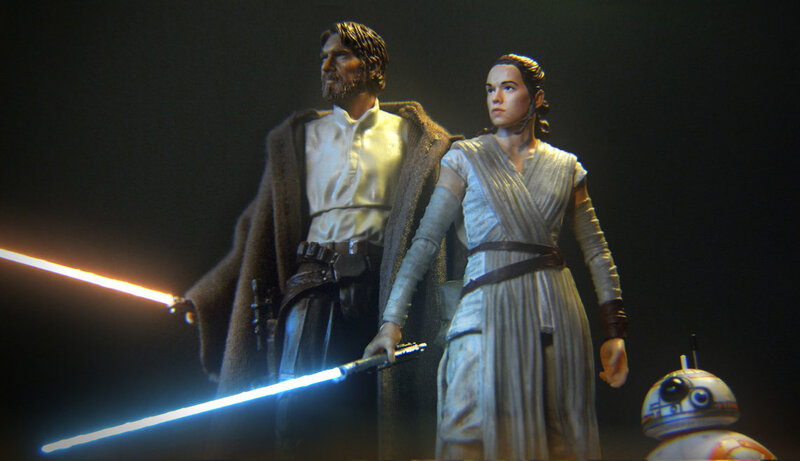 We heard it when Luke accepted his call to adventure, and now Rey is accepting hers. A hero is born. On paper, you’d think the ending to this movie would be infuriating. We finally find Luke Skywalker, and then the movie ends. But it works. Despite only appearing on camera for a matter of seconds, Mark Hamill did not have an easy job. He had so much to covey in so little time. This is the first time we’ve seen the character in so many years, and so much has happened. So the audience is just staring at him, taking in all the details. I’ve heard that Hamill steals the show in The Last Jedi. I hope that’s the case. It’s time for mainstream moviegoers to see what we in the geek community have known for a long time: This man is a gem. This entry was posted in Movies and tagged BB-8, Ben Solo, Billie Lord, C-3PO, C-3PO red arm, Captain Phasma, Carrie Fisher, Chewbacca, Finn (Star Wars), Han Solo, Harrison Ford, Jakku, Kylo Ren, lightsaber, lightsaber duel, Luke Skywalker, Mark Hamill, Millennium Falcon, Mos Eisley Cantina, Movies, Mrs. Primary Ignition, Princess Leia, Rey (Star Wars), Rob Siebert, Star Wars movies, Star Wars: Episode VII, Star Wars: Episode VII - The Force Awakens, Star Wars: Episode VIII - The Last Jedi, Star Wars: The Force Awakens, Star Wars: The Last Jedi, The First Order, The Last Jedi on 12/16/2017 by primaryignition. I’ve curbed my expectations when it comes to this Poe Dameron series. I’m no longer looking for info regarding the state of the galaxy before The Force Awakens. This is simply an action-adventure title, which is fair enough. 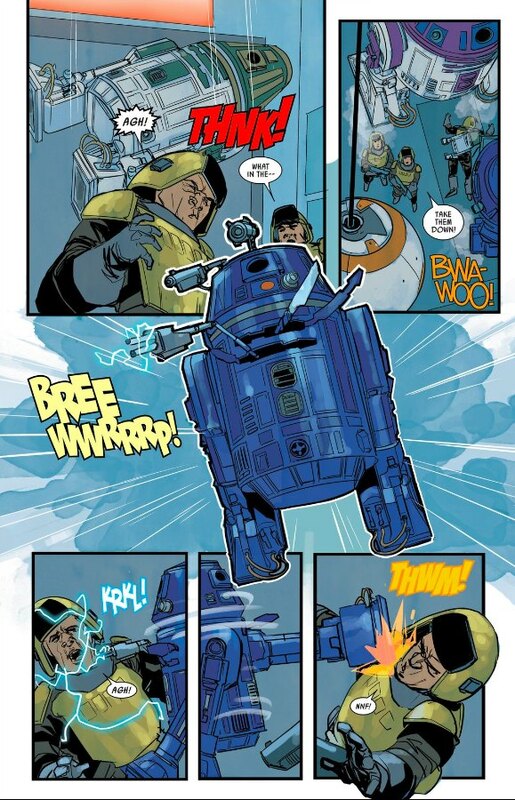 What I didn’t expect coming into issue #5 was for BB-8 to steal the show. BB-8 becomes the hero in this issue, leading the other Black Squadron astromech droids on a mission to compromise the prison’s security system. What follows is essentially Mission Impossible meets “Duel of he Droids.” The astromechs hide from guards, until we get what can only be described as a bit of droid martial arts (shown below). 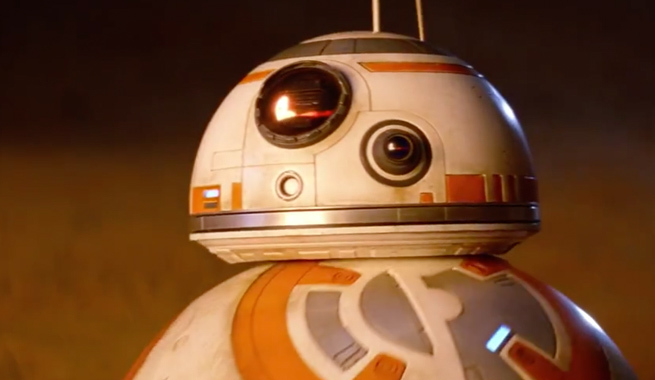 It’s a lot of fun, and very reminiscent of the BB-8 we saw in The Force Awakens. Soule and Noto also do a tremendous job of capturing the charm and heart Oscar Issac put into the Poe character. He’s one for sarcastic quips, obviously. But he’s also a born leader. He’s compassionate and empathetic toward his teammates, and he stays positive even in the most dire scenarios. Soule gets Poe Dameron. Phil Noto is pretty good at drawing him, too. Handling the pencils, inks, and colors on this series, Noto makes each setting in this issue very distinct. A sickly yellow haze hangs over Megalox Beta. Terex finds his way into a dingy and dimly lit cantina, not unlike the one we saw at Mos Eisley. The hangar the droids initially find themselves in is very calm, and has an almost relaxing quality to it with different shades of grayish blue. A stark contrast to the chaos they’re about to cause. And it all feels very familiar, very Star Wars. Noto also gives us a great cliffhanger shot, with the camera down on BB-8’s level as he looks up at a sizable new adversary. Poe Dameron isn’t the book I wanted it to be. But the last two issues have been more fun, adventurous, and exciting than most of the Star Wars content Marvel has put out since it got the license back. It’s tough to sling mud at something like that. 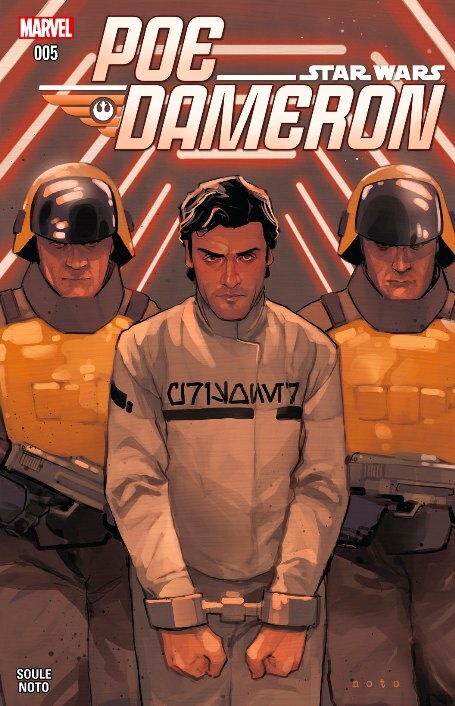 This entry was posted in Uncategorized and tagged BB-8, Black Squadron, Charles Soule, comic book reviews, comic books, Marvel, Marvel Comics, Phil Noto, Poe Dameron, Rob Siebert, single issue reviews, Star Wars, Star Wars comics, Star Wars: Poe Dameron, Star Wars: Poe Dameron #5 (2016), Star Wars: The Force Awakens, The First Order on 08/18/2016 by primaryignition. Star Wars: Poe Dameron has a lot going for it. Soule is an excellent writer who has experience in that galaxy far, far away. Phil Noto is supremely talented. There’s a lot of buzz coming off The Force Awakens, and there’s still much we don’t know about the events leading up to that movie. What’s more, Poe comes off very likable here. So is it wrong that I left this issue disappointed? 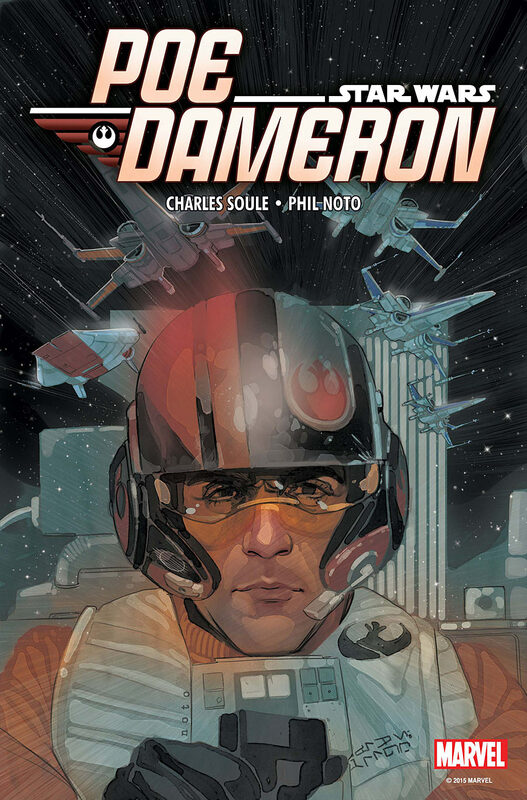 Star Wars: Poe Dameron #1 picks up shortly before the events of The Force Awakens. General Leia Organa sends her best pilot, Poe Dameron, in search of Lor San Tekka (the man we saw Poe with at the beginning of the movie). Leia believes him to be their best hope of locating her brother, Luke Skywalker. But as Poe will learn, the First Order will not hesitate to strike if opportunity arises. The solicitation for this issue told us this series would give us “backstory leading directly into the holidays’ greatest adventure.” So it’s not exactly surprising to see the story focus on Lor San Tekka, and the details on what brought Poe to him. But it bears repeating: There’s still so much about the state of the galaxy that we don’t know. How was The First Order formed? What was the New Republic like? Lor San Tekka was a member of something called the “Church of the Force.” What the hell was that about? Sadly, we didn’t get much in terms of information. We also don’t learn much about our title character. It’s not like we need to have a big revelation. Just a nugget of new info would have done the trick. Phil Noto is a very welcome addition to this book, having just come off of the Chewbacca miniseries. He’s very good at capturing the actors’ likenesses, while still keeping his his flair for animation in there. 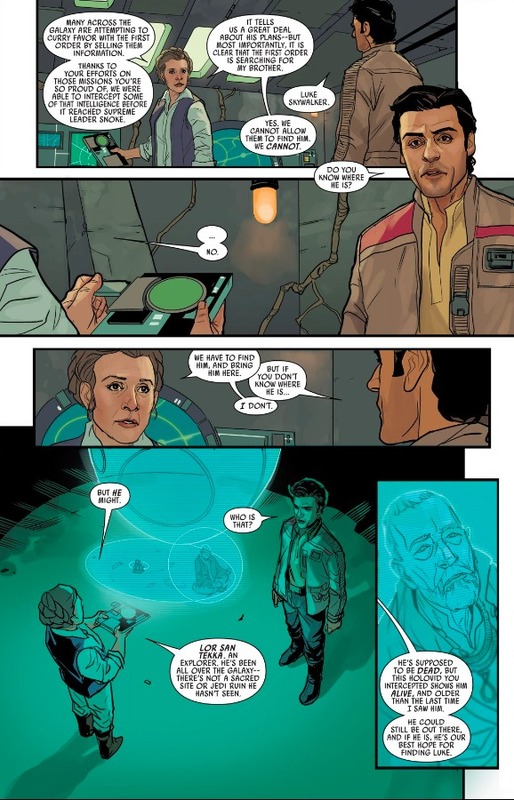 The little touches he adds to Poe and Leia’s faces in this issue really make them come to life. He also draws a damn fine BB-8, and a gorgeous X-Wing fighter. Hopefully he gets a well-deserved chance to have a decent run here. 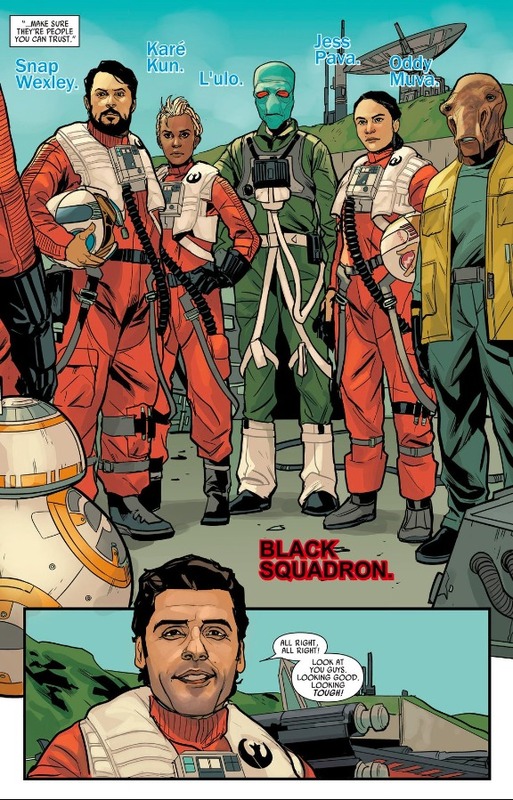 This issue sees Poe assemble Black Squadron, i.e. the star fighter pilots from The Force Awakens. We see one of the member is L’ulo, a green-skinned alien we first saw in Shattered Empire, who flew with Poe’s mother. We don’t see them touch on that here, aside from a brief mention that L’ulo has fighting with Leia for years. But it’s definitely something they can touch on later. Charles Soule writes a very witty and likable Poe. The issue sends him into a giant cavern of some kind, where he finds a group of people who worship a big egg of some kind. That’s not exactly the direction I hoped this issue would take, but Soule is good at writing Poe with his back against the wall. At one point, Poe is trying to get himself out of a jam, and says: “What’s with the tone? No one wants to hurt your egg. I like your egg!” Combine that sort of humor with the presence of the adorable and faithful BB-8, and our book is in good hands. We also get a brief back up story by Chris Eliopoulos, which is very comic strip-ish in the vein of Calvin & Hobbes. We see BB-8 become the go-between for two pilots who are crushing on each other. The Earth didn’t move for me on this one. But no harm done. Star Wars: Poe Dameron #1 is a good start. Not a great one, but a good one. There’s a lot of potential to continue expanding this portion of the Star Wars timeline, if Soule, Noto, and the team are allowed to. With Episode VIII getting closer every day, that might not be a bad idea…. This entry was posted in Comic Books/Graphic Novels and tagged BB-8, Charles Soule, Chris Eliopoulos, comic book reviews, Lor San Tekka, Marvel, Oscar Isaac, Phil Noto, Princess Leia, Rob Siebert, single issue reviews, Star Wars, Star Wars comics, Star Wars: Poe Dameron, Star Wars: Poe Dameron #1 (2016), Star Wars: The Force Awakens, The First Order on 04/11/2016 by primaryignition. That’s pretty much been the energy surrounding The Force Awakens as a whole. We’ve all felt it. 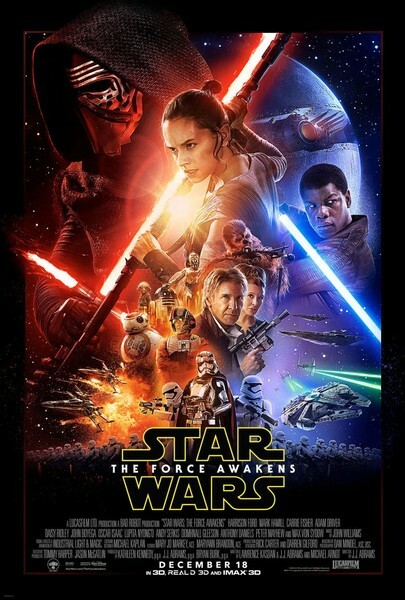 This film represents a new dawn for the Star Wars franchise. And the box office figures indicate, we’re ready to greet the day. The plot for this movie has been delightfully shrouded in mystery from the get-go, and I see no reason to go into detail now. But here are the basics. Thirty years after Return of the Jedi, the First Order has risen from the ashes of the Empire. Near the top of their ranks is Kylo Ren, a mysterious warrior following in the footsteps of Darth Vader. But new heroes will rise, such as Rey, a scavenger on the planet Jakku. At her side is Finn, a defected stormtrooper whose conscious led him away from the violent First Order. This duo will fight alongside none other than Han Solo and Chewbacca, heroes of the Galactic Civil War. All the while, the Resistance, led by General Leia Organa, searches for the one hero missing amidst the conflict: Luke Skywalker. As a life-long Star Wars fan, I can indeed confirm that The Force Awakens is good. But it’s a different kind of Star Wars movie. Not drastically so, but Star Wars die-hards may notice. Certain portions have dimmer lighting, which leads to a darker vibe. There’s also a little more blood than we’re used to seeing from Star Wars. It’s still a scarce amount in the grand scheme of things, but it’s noticeable. I attribute this to the absence of George Lucas, who wasn’t there to micromanage things in his own…ehem…unique way. I’m not complaining, mind you. I’m a George Lucas fan. But if The Force Awakens proves anything, it’s that Star Wars needed to get away from him. The man who wrote and directed the prequels could not have created a movie like this. This movie gives us new heroes we can invest in and care about. While it doesn’t shy away from nostalgiac winks here and there, it doesn’t need to be propped up by original trilogy elements the way the prequels did. It’s a thrill ride very much worthy of the Star Wars legacy. The original trilogy character we spend the most time with is Han Solo, who is as charming and witty as ever. 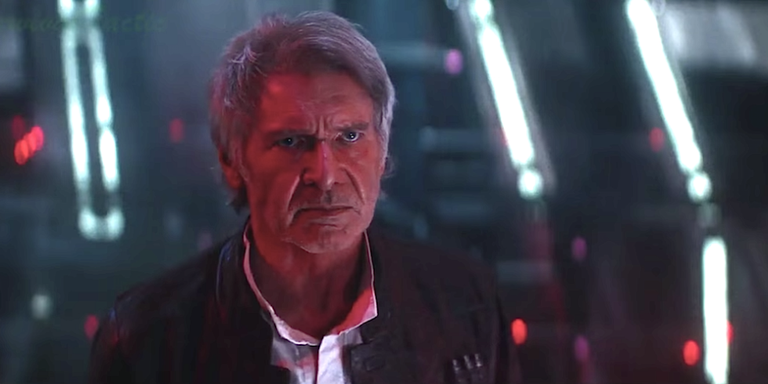 Harrison Ford essentially gives us exactly what we wanted to see from that character. He’s not necessarily the same daring rogue. But he’s still Han Solo. 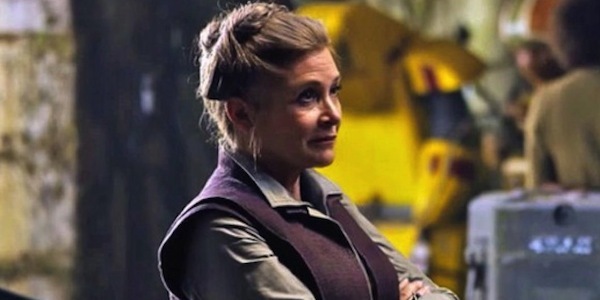 We also see a good amount of Carrie Fisher as General Leia Organa. It’s especially cathartic to see her in the role again. It’s such an iconic character, and she deserved that renewed spotlight. As for Mark Hamill’s portrayal of Luke Skywalker…that would be a spoiler. Most of the new characters we meet are intriguing. But for my money, none are more interesting than Kylo Ren. It’s encouraging that he’s not simply a Darth Vader clone. He’s very much his own man, with his own demons. Some may argue that makes him less threatening than Vader, or other Star Wars villains. But without saying too much, there’s a level of instability there that should make for an entertaining journey. A fair complaint about The Force Awakens is that it’s simply the original Star Wars film done over again. The similarities are undeniable. We have our hero on a desert planet who gets a call-to-action from a droid, and is quickly swept into a galactic war against a Nazi-like organization with a base that has the power to destroy planets. Sound familiar? At one point, they even do a side-by-side comparison of Starkiller Base and the Death Star. The inside of the base is also clearly modeled after the Death Star! Given what we’d seen from our most recent Star Wars movies, I’d argue a throwback isn’t the worst thing in the world. This movie gives people the Star Wars they want to see. Good and evil, the Rebellion and the Empire, Jedi and Sith. Some of the names have changed, but at their core, they’re the same. As a bonus, we even get to see some of the faces we fell in love with from the original trilogy. The Force Awakens is designed to jump-start the Star Wars franchise, getting us to remember what we loved about the originals while introducing new faces to carry the brand into the future. It accomplishes that goal, easily giving us the best installment in the series since Return of the Jedi. Lingering questions do remain, but I expect they’ll be resolved in future films. It’s fun to watch The Force Awakens, and if there’s anything that’s been missing from Star Wars in recent years, it’s that sense of fun and adventure. J.J. Abrams, Lawrence Kasdan, and everybody else involved with this movie deserve credit for living up to the hype, and restoring something that was lost. So rejoice Jedi, wookies, droids, and even you damn gungans! Star Wars is fun again! This entry was posted in Movies and tagged Adam Driver, Bad Robot Productions, BB-8, C-3PO, Captain Phasma, Carrie Fisher, Daisey Ridley, Daisy Ridley, Darth Vader, Death Star, Disney, Domhnall Gleeson, Finn (Star Wars), George Lucas, Han Solo, Harrison Ford, J.J. Abrams, John Boyega, John WIlliams, Kylo Ren, lightsaber, Lucasfilm Ltd, Luke Skywalker, Mark Hamill, Millennium Falcon, movie reviews, Movies, Poe Dameron, Princess Leia, R2-D2, Rey (Star Wars), Rob Siebert, Star Wars, Star Wars movies, Star Wars prequels, Star Wars: Episode IV - A New Hope, Star Wars: Episode VI - Return of the Jedi, Star Wars: Episode VII, Star Wars: The Force Awakens, Starkiller Base, Stormtroopers (Star Wars), The First Order, Walt Disney Pictures on 12/19/2015 by primaryignition.